These have always been one of my favourite chocolate treats. I know I have an endless amount of chocolate recipes, but they are my favourite sweet recipes to make. I always used to make crispy treats when I was younger, they’re such an easy, quick and tasty dessert to make – as well as being delicious. 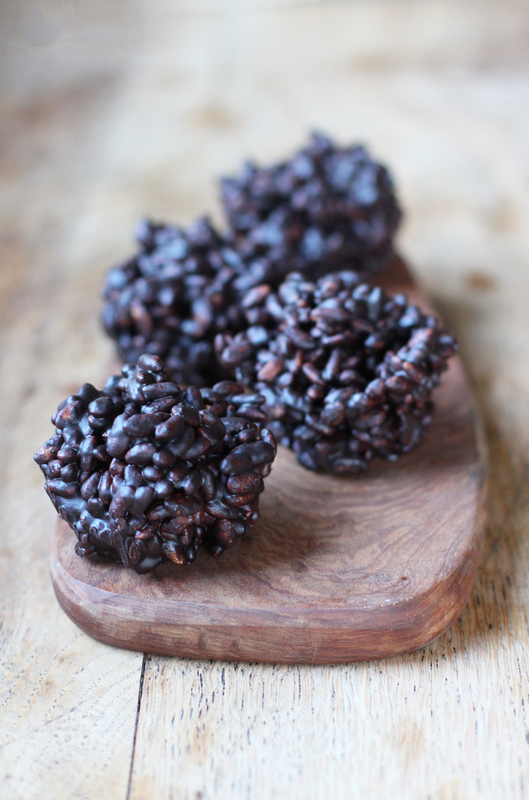 There’s something amazing about the combination of smooth chocolate with a crunchy, crisp texture like puffed rice. I also used to enjoy making these with corn flakes too, anything that gives that nice snap! 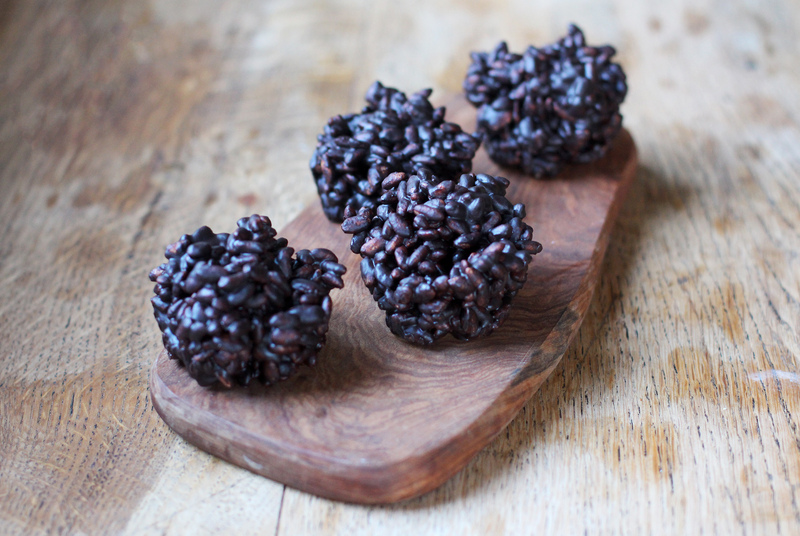 You could also try these with puffed quinoa, millet, buckwheat or oats – so you can really get creative if you like! These are also the perfect easter treat – you can press them into egg moulds or nest shapes. However you make them, I hope you enjoy this recipe! 1. Firstly, place your oil into a pan on a low-medium heat to melt. Once the oil has melted, remove from the heat and stir in the cocoa powder and a pinch of salt until smooth. Then, stir in the maple syrup and puffed rice. 2. When all of the ingredients are well mixed, take a spoonful and scoop into individual muffin or cupcake cases, inside of a baking tray. I used large muffin cases, which made 5, but if you use cupcake cases you will be able to make more! Alternatively, you could try pressing the whole mixture into a small cake tin, pressing it down in the middle, and up around the edges to make a nest (perfect for easter). 3. When this is done, move the treats into the fridge to set for around 2-3 hours, then serve. Bookmarked! Thanks for this yummy recipe. I can’t wait to try it out! 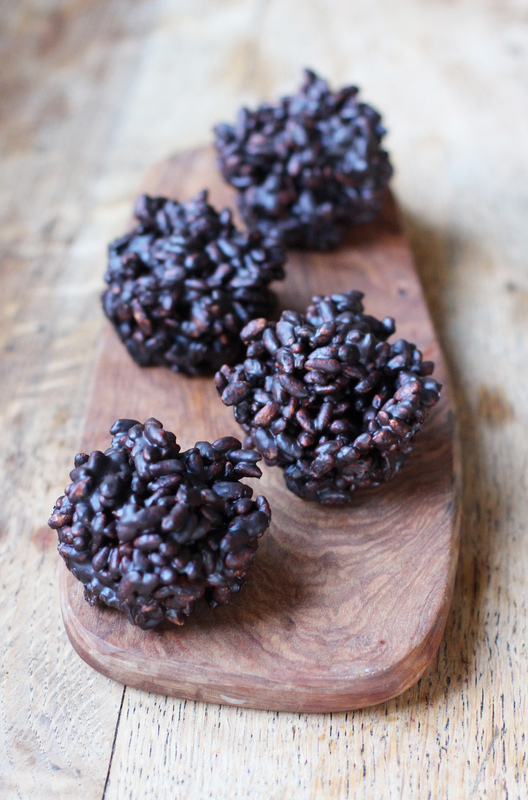 I might even replace the puffed rice cereal with Nature’s Path vegan “cocoa puffs”! Thanks for the lovely recipe, but I want to make it out of couveture then what will be the recipe?